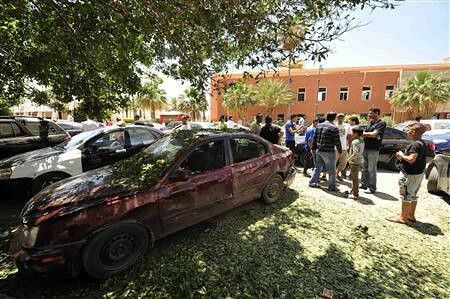 Police station bombings in Benghazi on May 10, 2013. The government in London later announced it was scaling down its diplomatic staff inside the country., a photo by Pan-African News Wire File Photos on Flickr. A Libyan police officer has been killed and another wounded in fresh attacks in Benghazi, in another sign of the mounting violence in the eastern city, a security official says. 'Unknown shooters gunned down a police officer and seriously wounded another during two separate attacks on Wednesday evening in Benghazi,' said Lieutenant-Colonel Ibrahim al-Charaa, spokesman for the city's security forces. 'The murderers... fled the scene after firing off a hail of bullets,' he said, adding that the victim died of his wounds upon arriving at hospital. In the other attack, he said the gunmen fired on a police officer who suffered a gunshot wound to the head, leaving him in critical condition. Benghazi, cradle of the 2011 U.S. and NATO-backed counter-revolution that toppled Muammar Gaddafi, has been caught in spiralling violence since his fall. Militants in the city have targeted judges, members of the security forces, local government officials and journalists in recent months.